"This was the day for eating simnel cake, with its layers of yellow marzipan and eleven marzipan balls on top, said to signify the twelve disciples minus Judas.[...] The yellow of marzipan, the yellow of eggs, the yellow of saffron: the colour of spring." I will keep my message short and sweet for once! I wish you all a peaceful, Holy, happy Easter full of flowers, love, and, dare I add, chocolate. I hope you are surrounded by your loved ones and that there is laughter and sunshine for each and every one of you. I am delighted to write that I am taking Héloïse, Tristan (together with his guitar), and Angélique to see my parents in England in a few days' time. We've all been waiting eagerly for this opportunity. Poor Mickaël, who is suffering from a Badminton induced injury, will have to stay behind and keep Gaspard the dog company. To celebrate Easter I have created a springtime hare whose name is Primrose Pascaline. 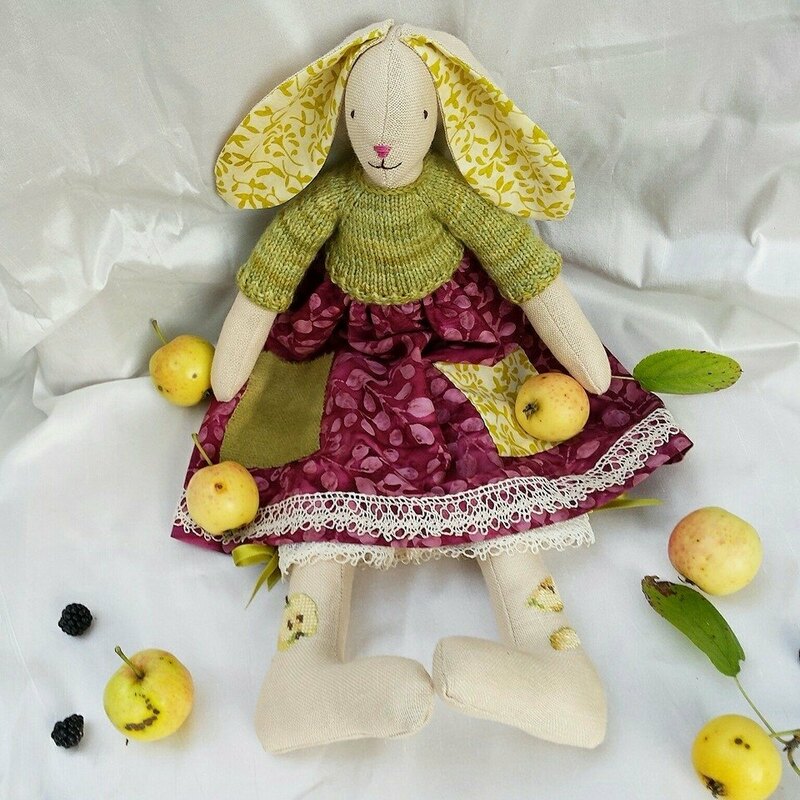 An egg yolk yellow flowery skirt, embroidered apple blossom and violets on her ankles and a pair of bloomers made from a patchwork of spring flower fabrics. My favourite fabric of all is the Liberty you can spot on her Easter egg filled skirt pocket. It has pretty cowslips on it! If you are interested in giving her a home you may find her here. I should add that I intend to cease hare-making production in the near future. 'Hurrah', some of you might cheer! All good things come to an end. And new doors open, I believe. Since my previous post I've had to give up any foolish hopes of holding on to early spring. It's full steam ahead from now on: purple-tinged irises, an abundance of trailing wisteria covering honey-coloured high walls and filling the air with their sweet scent, lily of the valley, lilac, poppies, roses tumbling open against barely unfurled greenery. All are jostling for attention against a delightful backdrop of carnival-hued tulips with silky petals. "Look at me, look at us!" they clamour silently. The primroses are still gracing us with their demure presence. We must, sadly, bid farewell to the daffodils, narcissi, and wild violets for yet another year. We are no longer at the awakening of spring but reaching the heady heights of a green countryside punctuated with the brilliance of flowers. It calls to mind Botticelli's Primavera which depicts Zephyrus hot in pursuit of sparsely clad Chloris, the virginal Greek personification of Spring, and her subsequent transformation into Flora, the Roman goddess of flowers, crowned with blossom, her robe embroidered with pinks and roses, her arms filled with flowers. Fortunately, I can hold on to those early spring flowers thanks to Silke Leffler's charming illustrations in the children's book below. Her visual personification of plants always delight me. Spring so far has brought its fair share of challenges. Will this be the year we finally sell our fisherman's cottage by the sea after six years of legal struggles? When will we finally be able to purchase our own home here near Tours? We've also been endeavouring to nuture Héloïse during this Baccalauréat year both physically and emotionally. She is hoping to leave France in September to take up her offer at Durham University which is thrilling, of course. However, the complexity of the paperwork involved is challenging my desire to remain serene! Although the pros of living between two countries clearly outweigh the cons the journey is rarely straightforward at the outset. But that is life, as I am sure you will agree, and there are so many treasure around to enjoy. Our first visit to the gardens of Villandry this year with its complex boxtree parterres playing shadow games on the fine gravel with sunlight and birdsong everywhere. The persistant call of the cuckoo. A harp recital held in the Tours Fine Arts Museum one evening listening to Domenico Scarlatti's music surrounded by eighteenth-century paintings with an enthralled Tristan squeezing my arm. Actually, there have been a number of concerts this season; each different and all wonderful. It's good to watch a four-year old Angélique as absorbed by the music as her siblings. There are two cherry trees in our garden: one is covered with thick pink puffiness the colour of my mother's homemade strawberry ice-cream and frilled with yellow nascent leaves. The other, fully clothed in pure white, provides us with gentle drifts of petals. "Look, it's snowing!' cry the children in delight. But even as I write today the latter has shed its beauty, and the pink wonder is dropping flurries of petals too. It's all too ephemeral but the lunches beneath the cherry-tree branches this week have been committed to family memory. And together with the cherry trees and spring comes a surge of inspiration. Tell me, is this happening to you too? I am determined to hold on to this natural beauty and the colours by slowly and surely weaving them into my creative projects. However as I painstakingly stitched Fleur de Cerisier, my cherry blossom doll, with a vintage cotton sheet hand-dyed in Easter tea (such a delicious smell), I realised that my dollmaking skills need to be worked on. I really need to make more refined facial features! My initial frustration and disappointment with my completed doll were, fortunately, replaced by the desire to improve my abilities with the next one; to create a completely new pattern. It is a thrilling thing this creative journey which involves paradoxical feelings of 'this is going to be amazing' to 'oh no, it's really bad' and then back full circle to 'it's pretty good, actually'. When your creative skills fail you, you can always bake a simple cake with crystallised spring flowers (brushed with egg white and gently coated in white sugar) and eat it under the flowering cherry tree. So tell me, do you lose confidence in your creative abilities sometimes? If so, how do you deal with it? Warmest wishes to you all for a beautiful spring in full flower. I aim to return soon. ps I am in two minds about selling Fleur de Cerisier. If you would like to give her a home just leave me a comment or e-mail me. Thank you so much.